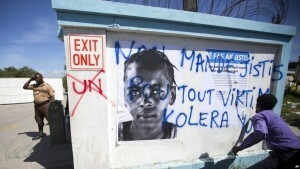 After admitting the role of UN peacekeepers in causing Haiti’s deadly cholera outbreak, the UN is far behind in its goals to remedy the crisis. The ambitious $400 million plan would provide reparations to cholera victims, decrease the number of yearly cholera cases and invest in development projects to provide more clean drinking water and toilets. However, voluntary contributions to the campaign have constituted a mere 2% of necessary funds, sending a clear red flag that cholera victims may continue to wait for their promised reparations, or not receive them at all. An excerpt is shown below. Click HERE for the full story. Late last year, the United Nations promised to strengthen its fight against the spread of the deadly cholera disease. U.N. peacekeeping troops unknowingly brought the disease to Haiti seven years ago. But, so far, the U.N. has raised just a small amount of the estimated $400 million it needs over the next two years to fight the disease. U.N. Secretary-General Antonio Guterres wrote that the voluntary funding received so far makes up only 2 percent of its goal. It has received around $8 million in funding. The letter said that, as of February 8, Chile, France, India, Liechtenstein and South Korea together had promised almost $2 million. Outside of that fund, Japan has promised $2.6 million and Canada has committed about $6 million. Guterres asked all member states to notify him by March 6 of their plans to help finance the campaign.